Features: Depth/Temp 50/200 kHz 600 W RMS Mid-performance Bronze The bronze B60-12° and B60-20° provide a vertical beam without a fairing. Inside the housing, the ceramic element is tilted to provide built-in deadrise compensation. The resulting vertical beam provides excellent echo returns for more accurate depth readings. 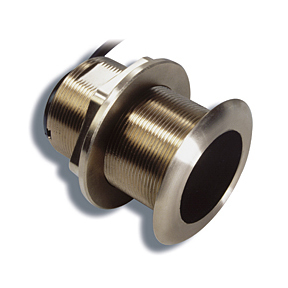 The nearly flush housing minimizes drag with only 5 mm (3/16") extending outside of the hull. With Northstar 10 pin connector. The bronze B60-12° and B60-20° provide a vertical beam without a fairing. Inside the housing, the ceramic element is tilted to provide built-in deadrise compensation. The resulting vertical beam provides excellent echo returns for more accurate depth readings. The nearly flush housing minimizes drag with only 5 mm (3/16") extending outside of the hull. With Lowrance Blue connector.